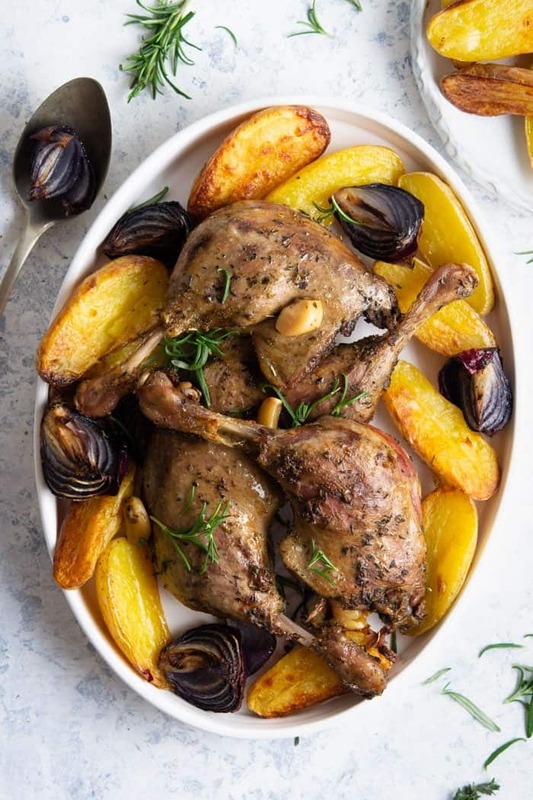 This delicious crispy roasted duck seasoned with garlic and thyme is served with caramelized onions and fingerling potatoes tossed in duck fat and makes for an amazing dinner! Besides being a knockout dinner, this roasted duck yields a pan of delicious duck fat, which you should definitely pour into a jar and store in the refrigerator for jazzing up future recipes. If you choose to broil the duck for extra crispy skin, you will need to cover the back half with foil to prevent over-browning. Duck meat is high in protein but it has a higher fat content than chicken and turkey. When roasted with the skin on duck has more saturated fat and cholesterol. You will find about 75 milligrams of cholesterol in a three ounce portion of duck meat roasted with the skin on. What does roasted duck taste like? Duck has a stronger flavor than chicken but it’s not gamey and overwhelming. I would compare it to the dark meat on turkey but note that the meat is more tender owing to the high fat content of the duck. Should you cover a duck when roasting? How Do You Make Roasted Duck? Preheat the oven to 325 degrees F. To prep your duck, remove the neck and giblets from the duck; discard or reserve for another use. Trim the excess fat from the neck and tail areas of the duck and discard them. Prick fatty areas of the duck (breasts and near thighs) with the top of a knife, cutting just into the skin but not piercing the meat. Now pat the duck dry with paper towels. Tuck the tail of the duck in, tie the legs together, then transfer the duck to a roasting pan. (If your pan is large enough, bake the potatoes with the duck). Stir the salt, herbs de Provence and pepper together. Sprinkle 1 teaspoon of salt mixture into the cavity of the duck and stuff with the onion quarters, garlic cloves, thyme and bay leaves. Drizzle with olive oil, and rub to coat. Sprinkle the duck liberally with the salt mixture and the remainder on the potatoes. If you’re not baking the duck and potatoes together, reserve some of the olive oil and salt mixture. 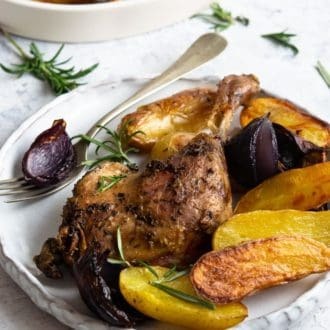 Bake for 1 hour then remove the pan from the oven and increase the temperature to 450 degrees F. Stir the potatoes to coat with rendered duck fat or pour some onto the potatoes if baking separately. Return the duck/potatoes to the oven and cook until browned and a meat thermometer inserted into the breast reads 160. About 25 minutes. If desired, you can broil the duck for 4 to 5 minutes for extra crispiness. Let the duck rest for 10 minutes before serving. 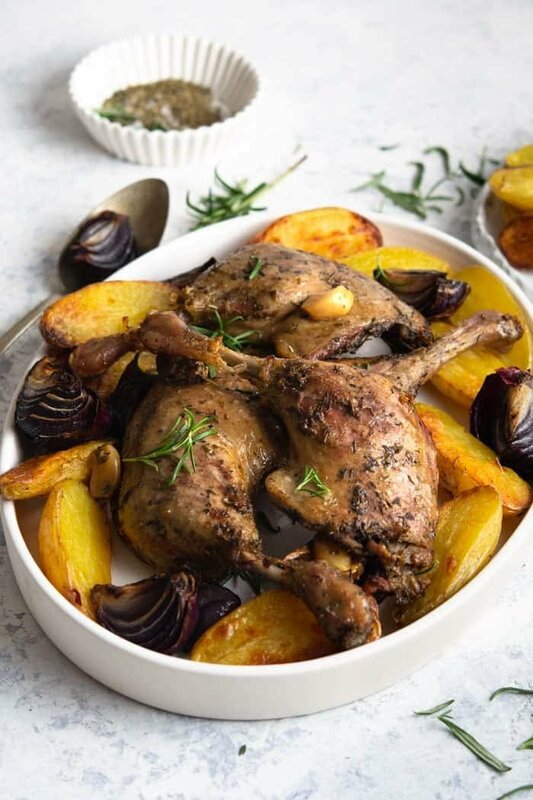 If your pan was not large enough to bake the potatoes with the duck; put them together in a large bowl and coat with the reserved olive oil and salt mixture. The onions should be cut into quarters and the potatoes into halves. Give them a gentle toss with your clean hands to make sure they are evenly coated. Transfer the potatoes to a pan and use the same baking instructions as above. Remove the potatoes after 1 hour of baking, coat with the rendered duck fat, and place back into the oven for 25 more minutes. 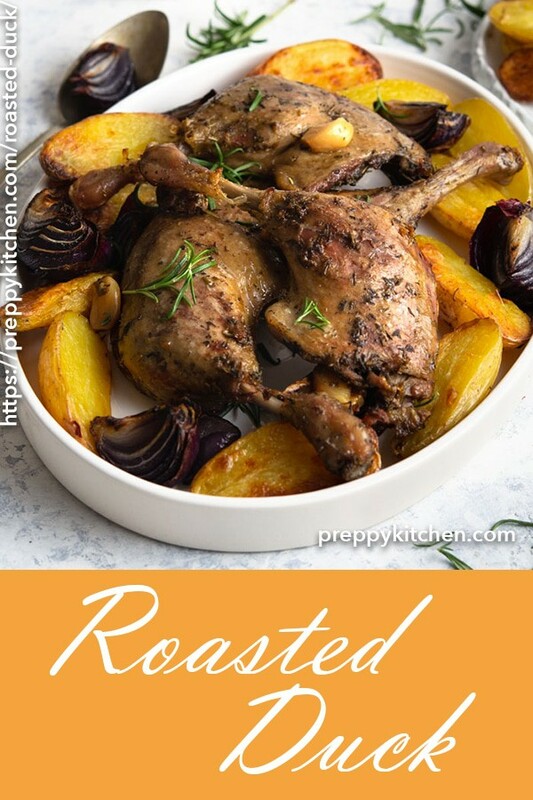 If you’ve tried this roasted duck then don’t forget to rate the recipe and let me know how you got on in the comments below, I love hearing from you! Tender and crispy roasted duck seasoned with garlic and thyme, served with onion and fingerling potatoes tossed in duck fat. Preheat oven to 325F. Remove neck and giblets from duck; discard or reserve for another use. Trim excess fat from neck and tail areas of duck, and discard. Prick fatty areas of duck (breasts and near thighs) with the top of a knife, cutting just into the skin but not piercing the meat. Tuck tail in, and tie legs together. Transfer duck to a roasting pan; add potatoes. Stir together salt, herbes de Provence, and pepper. Sprinkle 1 teaspoon of the salt mixture in cavity of duck; stuff with 2 onion quarters, 2 garlic cloves, thyme, and bay leaves. 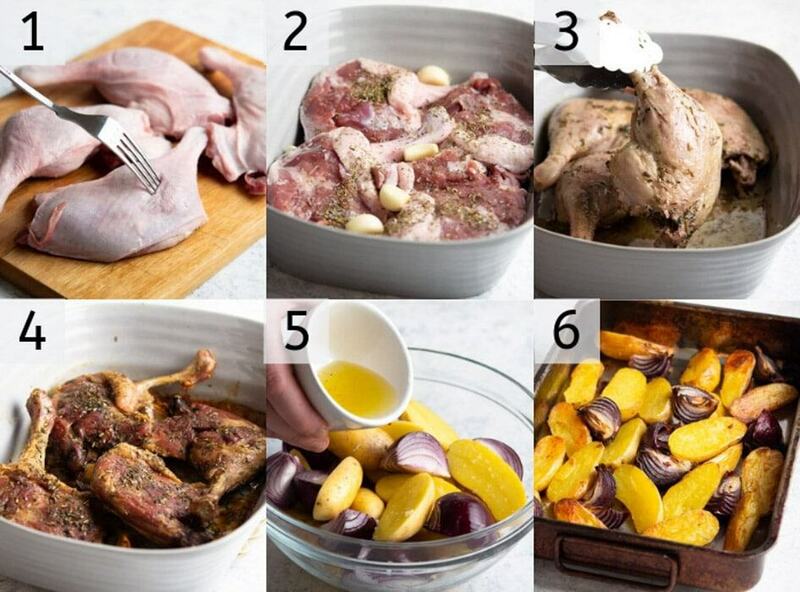 Drizzle duck and potatoes with olive oil, rubbing to coat. Sprinkle duck liberally with salt mixture; sprinkle remainder on potatoes. Bake for 1 hour. Remove from oven; increase oven temperature to 450F. Stir potatoes to coat with rendered duck fat. Return duck to oven; cook until browned and a meat thermometer inserted in breast reads 160, about 25 minutes. If desired, broil duck 4 to 5 minutes for extra crispiness. Let duck rest 10 minutes before serving. If your pan isn't big enough, you can bake the duck and potatoes separately using the same steps and instructions. I showed my dad this recipe and he made it for the family. It was really good, great flavor. Duck is one of my favorite dishes to prepare and this Preppy Kitchen recipe is just perfect to enjoy with a good glass of wine!